This has been yet another of the books that I’ve purchased and had sitting in its little brown paper ‘Readings’ bag waiting for a self-indulgent Christmas-time read, long after everyone else seems to have read it. Helen Garner seems to evoke strong reactions in her readers. I don’t think that it’s just that she chooses controversial topics: I think that it’s Helen Garner herself that some readers object to. As for me- I wish I knew her, although I suspect that she’d bridle against the thought that she could be claimed by a reader, and I think I’d feel a bit intimidated by her. I like the way that she puts her head on one side and considers hard…but then comes to a decided opinion. I like her occasional tartness and her willingness to revisit her own judgments. Any Melburnian could tell you about the Farquharson case- an appalling “accident” on Fathers Day 2005, where three young boys drowned when the car driven by their father after an access visit went off the road and ran into a dam. The father suffered a coughing fit, he said; an explanation accepted at first by his ex-wife at the first trial, but she later changed her mind. It was a convoluted legal process, involving a trial, an appeal and then a retrial and Helen Garner attended it throughout, drawn by equal parts of fascination and incredulity. 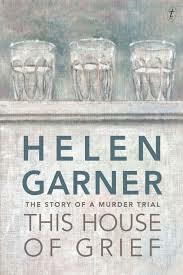 The subtitle to Garner’s book is “The Story of a Murder Trial” and the book largely consists of her observations of the theatre of the court as this performance of administering justice wends its slow, deceptively soporific way through questions that go to the heart of love, family, obsession and betrayal. What a good observer she is- the square faces that people pull when they’re trying not to yawn; the impatient ‘come along’ grasp of a sister pulling her adult brother through the press pack that sets itself up along the Melbourne footpath outside the court for the nightly news. Garner has her opinions: she judges. I wonder if the witnesses who appeared in the stand have read this book and found themselves stripped bare by her eagle eye. 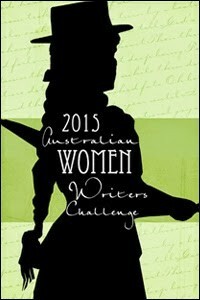 I’ve posted this to the Australian Women Writers Challenge for 2015. This entry was posted in Uncategorized and tagged Australian Women Writers Challenge 2015, Book reviews. Bookmark the permalink. I don’t want to start an argument, but I note that you call what happened at that dam ‘an accident’. An exhaustive legal process found that it was no accident at all. A tragedy, yes. An accident, no. Thank you- I’ve added some inverted commas. I completely agree with you RJ. I think she’s ver good too. Sometimes she infuriates me – though not in this book – but I love her fierce honesty like you do. I love how she takes us along with her thought processes, how she questions herself. I thought this was an excellent read. I too would love to meet her, but I think she’d intimidate me too (as I also feel about Margaret Atwood! ).